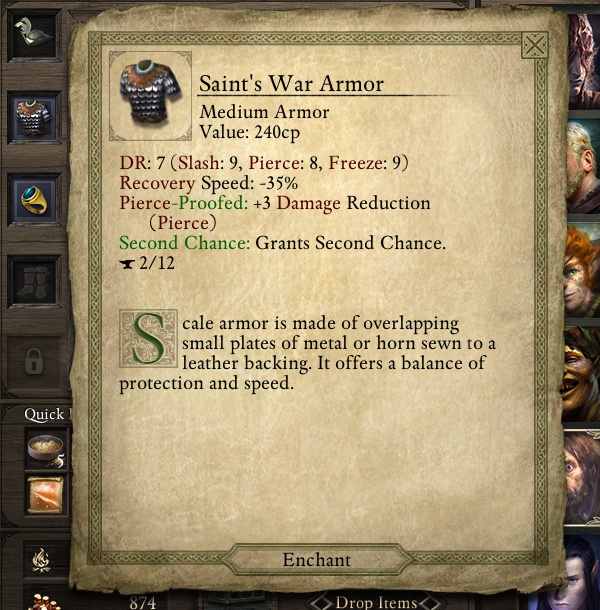 Enchanting the Saint's War Armor with the "Fine" quality causes it to lose all its pierce resistance, even the natural pierce DR that scale armor is supposed to come with. It correctly gains 2 DR and 2 Slashing and Freeze DR, but does not display having pierce resist at all. The +3 Pierce bonus displays on the character's detailed information screen alongside the +2 bonus from Fine, but the stat overview on the inventory/paperdoll screen does not show him as having any Pierce DR. 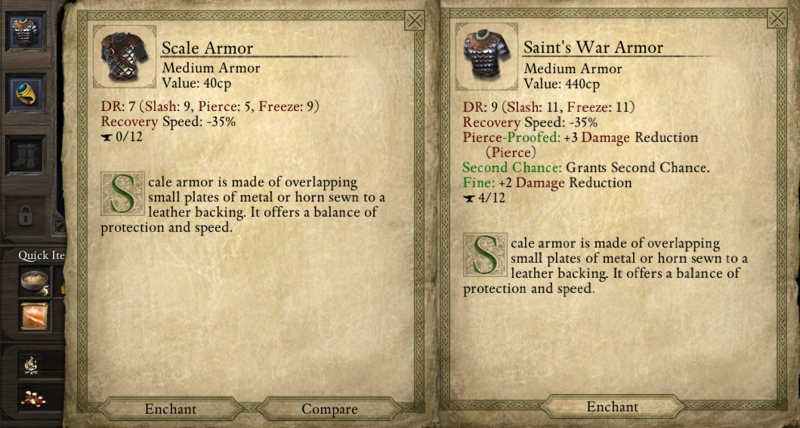 I also tried attacking the party member in question using a pierce weapon before and after the enchant to see if this may simply be a tooltip/display error, but the results were unclear - the damage differences between wearing the normal Saint's War Armor, after enchanting it to Fine, and after putting on a leather armor with no natural pierce DR, were all so slight that any changes could have just been natural damage variance. If there's no exception listed, the general DR applies. Your upgraded SWA has DR 9 vs. pierce attacks. Edited by waretaringo, 30 April 2015 - 10:45 PM.